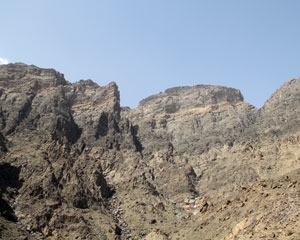 This magnificent landscape is dominated by a cliff which shows the contact between Ordovician Amdah quartzite at the base which was deposited nearly 500million years ago in a shallow marine environment and Permian Saiq carbonate also marine sediment but deposited around 250 million years ago. Although the two layers of sedimentary rock are in direct contact with each other, the 250 million years of sediments that should be in between are missing, which makes the place not only beautiful but also geologically special. On the plateau above on top of these cliffs accessible only by steeply mountain paths are small mountain settlements where people still prefer to live according to traditional ways.